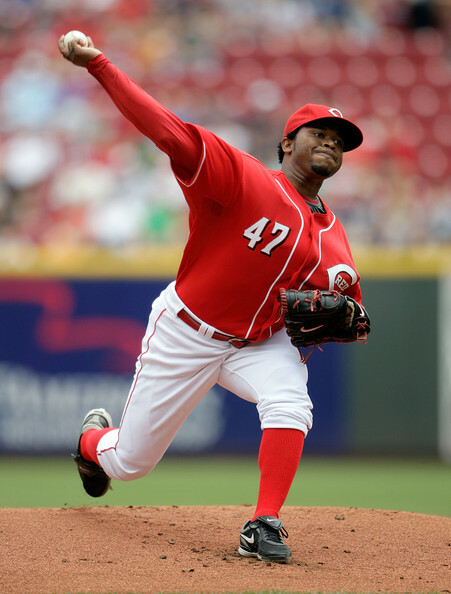 From Elias: Francisco Cordero pitched in all three games of the Reds series against the Braves and capped those appearances with his 29th save of the year on Sunday. Cordero has pitched three or more consecutive days eight times this season, far more often than any other major-league closer. No other pitcher with more than one save this season has made appearances on three or mre consecutive days more than four times. 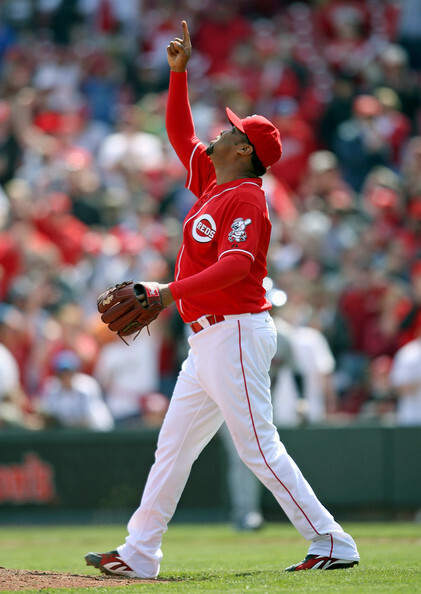 Should A. Chapman become a Starting Pitcher in 2011? BREAKING NEWS!!! WE ARE COMING BACK!!! YOUR FIRST PLACE CINCINNATI REDS!!!! REDS ALERT 5-24-12: Free Game of the Day – Braves vs. Reds at 7 pm ET. Major League Baseball Commissioner Rob Manfred has never been to an Opening Day in Cincinnati. Manfred is excited to experience one for himself, now that he has the honor of being the grand marshal of the 100th Findlay Market Opening Day Parade on March 28. Since Jesse Winker suffered a season-ending shoulder injury on July 23, he's gained a lot of company in the corner-outfield spots. New Reds outfielder Yasiel Puig has been in camp for about a week, often hitting on his own on the backfields. With the first full-squad workout taking place on Monday, Puig was able to warm up, throw and hit with his teammates. Upon the passing of his physical on Tuesday, the Reds signed infielder/outfielder Derek Dietrich to a Minor League contract with an invitation to big league camp for Spring Training. Reds manager David Bell has great corner outfield depth, but he doesn't have a regular center fielder. Determining who will get to play where and sorting out the log jam should be a challenge for Bell in his first season as a skipper in the big leagues. The next five weeks will see lots of shuffling on Major League rosters. Here are the most intriguing positional battles on each of the 30 MLB clubs. Even before the Reds underscored their determination to improve by making major offseason acquisitions for the club, first baseman Joey Votto was already working to improve his hitting and his overall game. Who do the Reds have in the pipeline? Get scouting reports, video, stats, projected ETAs and more for Cincy's Top 30 Prospects on MLB Pipeline's Prospect Watch. Utility player and Rule 5 selection Connor Joe has been working with the catchers since Reds Spring Training opened. What makes that a little more interesting is that Joe has never caught a game professionally. The Dayton Dragons (affiliate of the Cincinnati Reds) meet the Lake County Captains (affiliate of the Cleveland Indians) in the last game of a three-game set. Pabel Manzanero became the fourth player in Dayton Dragons history to hit three home runs in one game as the Dragons topped the Lake County Captains 7-4 on Tuesday night. The Dragons welcome the Great Lakes Loons to Dayton for four games over the coming weekend. Check out all the fun happenings at Fifth Third Field during the series! The Dayton Dragons (affiliate of the Cincinnati Reds) meet the Lake County Captains (affiliate of the Cleveland Indians) in the second game of a three-game set. The Lake County Captains erased a 4-0 deficit on the way to defeating the Dayton Dragons 5-4 on Monday night in the first game of a three-game series at Classic Park. The Dayton Dragons (affiliate of the Cincinnati Reds) meet the Lake County Captains (affiliate of the Cleveland Indians) in the first game of a three-game set. The Lansing Lugnuts scored three runs in the first inning and shut down the Dayton offense on only three hits as they defeated the Dragons 4-0 on Saturday afternoon. The Dayton Dragons (affiliate of the Cincinnati Reds) meet the Lansing Lugnuts (affiliate of the Toronto Blue Jays) in the last game of a three-game set. Dayton's Juan Martinez collected three hits including two doubles and drove in two runs as the Dragons defeated the Lansing Lugnuts 9-4 on Friday night. The Dayton Dragons (affiliate of the Cincinnati Reds) meet the Lansing Lugnuts (affiliate of the Toronto Blue Jays) in the second game of a three-game set. - The National League Cincinnati Reds announced today that Ray Martinez will return for his third consecutive season as field manager of the Billings Mustangs in 2018. In his first two seasons, 2016 and 2017, Martinez has compiled a 77-73 (.513) regular season record. Concerned about the strength of the muscles around his right shoulder, the Cardinals transferred right-hander Carlos Martinez to a no-throw program for the next two weeks, manager Mike Shildt announced on Tuesday. While a crowd gathered around Field 2 to watch Adam Wainwright face Yadier Molina, Matt Carpenter and Paul Goldschmidt in his first session of live batting practice on Tuesday, Alex Reyes, mostly inconspicuously, headed to a mound a few yards away for his most meaningful throws in almost nine months. It may be a new team and a new year, but that's really all that's changed for Paul Goldschmidt. Though this was his first day of his first Spring Training as manger of the Cardinals, Mike Shildt said he views it more as a continuous process from the 2018 season rather than a new beginning. On Tuesday morning, Javier Baez met with the media for the first time this spring, discussing last year's abrupt finish for the Cubs and his goals for the season ahead. He expects to see more daily urgency from the players, and he's hoping to once again hear those M-V-P chants from the fans pouring into Wrigley Field. The Cubs have innings to offer at second base this season and Ian Happ wanted to make sure he did not get lost in the conversation. Over the offseason, Happ made it known to manager Joe Maddon that he wanted to be considered for that position as the team mapped out its spring workout plans. On the field or in the clubhouse, there will be no easing into the spring for Cubs star Kris Bryant. It did not take long for Kris Bryant's comments at Cubs Convention last month to make their way to St. Louis. His audience of Cubs fans was laughing and cheering, but the Cardinals players who caught wind of his remarks most certainly were not. Cubs chairman Tom Ricketts addressed the team on Monday morning as he does every spring, but this year, he needed to discuss more than just the baseball season ahead. Off-the-field issues have dominated the focus recently for Chicago, creating distractions from the upbeat feelings typically associated with the start of camp. It took only two words for Alex Bregman to send 9-year-old Jax Nystrom into a frenzy, but this kind of reaction -- young people freaking out at the slightest bit of attention from him -- has become commonplace for the Astros' All-Star third baseman. The first Hall of Famer to join the Astros at Spring Training is Craig Biggio, who was in uniform for morning workouts on Tuesday and will remain with the team throughout the week. Astros outfielder Josh Reddick vows to start hitting to the opposite field more this year, which is something he did well in 2017, but not '18. Reddick hit .242 with 17 homers and 47 RBIs last year after hitting .314 with 13 homers and 82 RBIs to help the Astros to the World Series title in '17. Josh Bell stepped to the plate on Field 1 at Pirate City late Tuesday morning and assumed his left-handed stance. Major League Baseball will use pitch clocks during Spring Training games, Commissioner Rob Manfred said on Sunday, which possibly paves the way for the introduction of a pitch clock during the regular season. The Pirates don't seem too worried about the idea. The Pirates hired hitting coach Rick Eckstein and assistant hitting coach Jacob Cruz this winter to get more out of their bats, and their work begins in earnest this week. Eckstein and Cruz have set out to extract more power and consistency from a lineup in need of improvement. Before the Pirates took to the back fields of Pirate City for their first full-squad workout on Monday morning, manager Clint Hurdle addressed the team. He finished his speech with a call to action.